In the video, Champ is seen breaking down in tears after hearing this. She said the officer’s words cut deeply because, even though she’s pro-choice, the idea of having an abortion was never an option for her. Crystal Champ told Officer Holets that she had been addicted to crystal meth her entire life, she was living alongside a highway in New Mexico and she spends up to $50 at a time getting her fix of drugs. She said she had tried to get clean numerous times, but had failed at every attempt. In the body camera footage, Holets questions Champ and her companion for almost 11 minutes. He focused on Champ and tried to figure out whether she fully understood the danger drug use was inflicting on her unborn child. In the course of the conversation, Champ emotionally told Holets that she desperately hoped someone would adopt her baby. Champ said the words triggered a change in the officer’s demeanor. Holets made the call to not charge the couple with drug possession but he couldn’t shake the voice in his mind telling him that this was his chance to help and truly make a difference. Holets showed Champ a picture of his wife and four children, including a 10-month old baby and in that moment offered to adopt her baby. Champ was stunned and says she looked at him to “make sure his eyes were genuine and that I could see his soul.” She realized instantly, her prayers had been answered. Once his offer was spoken, Officer Holets had to immediately contact his wife. Rebecca Holets was a few miles away from the call when her husband jumped in his patrol car to break the news. He had told her how he had met a pregnant woman shooting up heroin and how he had offered to adopt her baby. The couple had discussed adopting in the future once their children were older, but when Ryan delivered the news, Rebecca never hesitated. Three weeks later, baby Hope was born. Due to her mother’s drug use, the newborn was born with an addiction to opioids, called Neonatal Abstinence Syndrome (NAS). The syndrome was treated with medical detoxing and a methadone treatment, but the long-term outcomes of NAS have yet to be discovered. Baby Hope could face behavioral and developmental problems later on in her life. 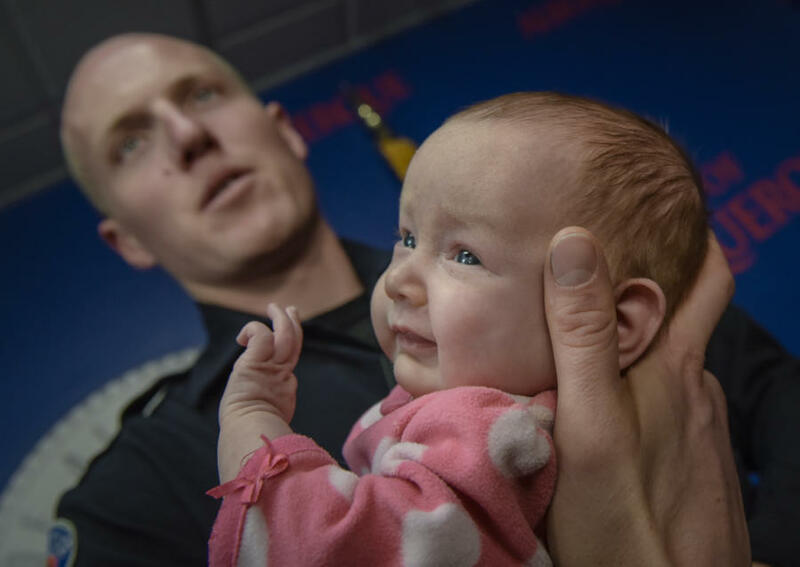 Hope is just one of thousands of babies born to opioid addiction. The Centers for Disease Control and Prevention released a study in 2016 that determined the number of neonatal abstinence cases tripled between 1999 and 2013. The National Institute on Drug Abuse estimates that a baby suffering from opioid withdrawal is born every 25 minutes in the United States. Hope is no longer in the hospital after her month-long stay. She and her family take her for weekly check ups but for the most part she is settling into her new routine. Her birth mother Crystal Champ has a bleak road ahead of her. She is still battling addiction and remains homeless. Champ was also given up for adoption as a newborn. She hopes that once her daughter is older she will realize how much her parents loved her for placing her with a loving family and that it was the best thing for her future. Her adoptive parents are aware of the future troubles that can face Hope, but are prepared to care for her. The threat of developmental issues is a very real possibility, but they are hoping that love and nurturing will help keep her healthy. Once Hope is older, and the time is right, they will share the details of her adoption. Rebecca and Ryan are open to having Crystal in her child’s life, but they know how difficult the road to recovery is. But after CNN checked in with Champ in December, they found not much progress. She and Key were living in an RV park, and Champ revealed she was offered treatment by a number of centers, all offering to get her into a recovery program. But she admitted she has struggled with accepting the offers. Last week, Holets and a team from a rehabilitation center in Florida met with Champ and Key. After a 20 minute long conversation, both had agreed to treatment. Holets then escorted the couple with their belongings to the airport. But during the drive, the decision was second guessed, overcome with anxiety the couple began to unravel. And their new beginning was over. The chance to start again refused, terrified of the idea of a new normal. They couple refused to get on the plane and missed their departure. Holets drove them back to the RV park where they would spend the night.